So this is a time of the year where we say goodbye. And I am reminded that I am in the midst of amazing tradition. During each winter and spring season, I get to devote my life to Michael and Michael. 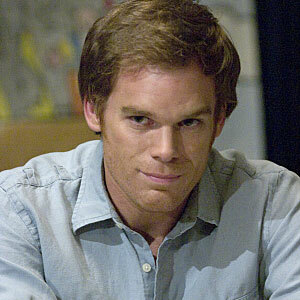 The first Michael is Michael C. Hall. But I have a tradition during the spring months, where I let my obsession with “Dexter” go wild. The second Michael is Michael Buckley who is a star web celeb and is the host of the “What the Buck Show.” He is hilarious, and he is climbing the ranks of the entertainment industry. Seriously, visit www.buckhollywood.com …good times good times. I started living like this in the winter/spring of 2009, where I would just sit at home and watch Dexter on DVD and What the Buck Show on the internet. Good times, good times.....no seriously, they were good times. QATFYG: Do you have a favorite web show? Do you have a favorite tv serial killer? And of course, who is your favorite Michael? - TV? nahhh. real life? nahhhh. serial killers are sick people and I am not down with that sickness. - I can't be bothered with web TV too complex.